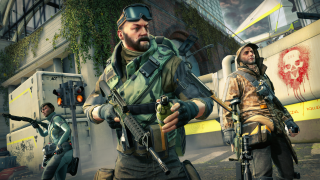 As announced at the PC Gaming Show today, Nexon and Splash Damage have given us 100,000 Steam keys for Dirty Bomb's Fragger mercenary (which is $8 at retail) to give away. "With a big gun and lots of ammo," they say, "this aggressive point man is a straight-up player-slayer, whether he's assaulting objectives or defending them." Drop your email in the form below to request a key—it's first come first serve—and watch the whole Dirty Bomb 'Scrubs' trailer above.